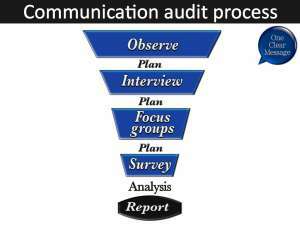 Do you need a communications audit? 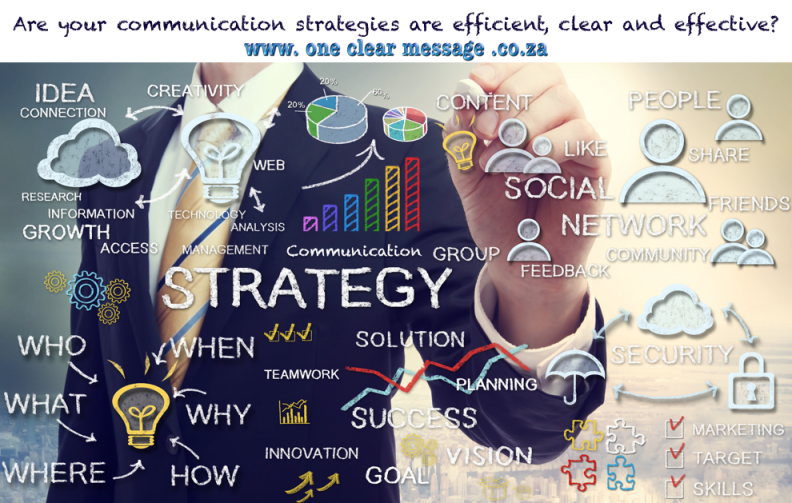 The primary reason for a communications audit is to test whether your communication strategies are efficient, clear and effective. The communications audit is a snapshot of your organisation’s communications programmes, practices and activities. The aim is to discover what is working, what needs adjustment and what needs to be changed. Observe: Observe and evaluate communication in the working environment, current organisational communication methods, the organisational structure and any barriers that prevent effective communication. Work flow is observed from the customer interaction to final delivery (all communications along the way). Interview: Interviews are conducted across three levels in the organisation. A cross section of employees are interviewed one-on-one on the organisation’s ability to communicate effectively. Management and the executive team are also interviewed using similar questions. 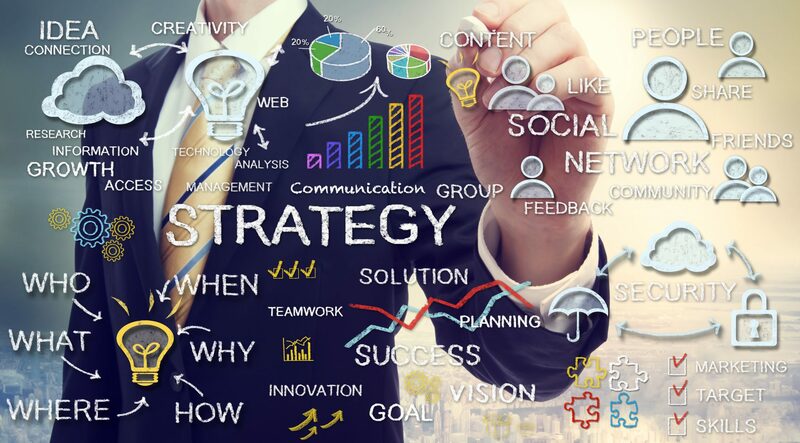 Plan: Identify the communication needs and objectives of the organisation. Prepare documents, create surveys and communicate the time and date the audit will take place. Planning needs t o be updated after each section of the process. Focus groups: Feedback from groups of people from different areas of the organisation that are formed to provide a variety of opinions on the organisation’s communication effectiveness. The discussions are facilitated to encourage participation and dialogue. Survey: The communications audit survey is designed for the specific needs of the organisation and completed by everyone (often online using survey monkey). The survey assess the organisation’s communication strategy and effectiveness using a 1-5 Likert scale rating of specific statements. 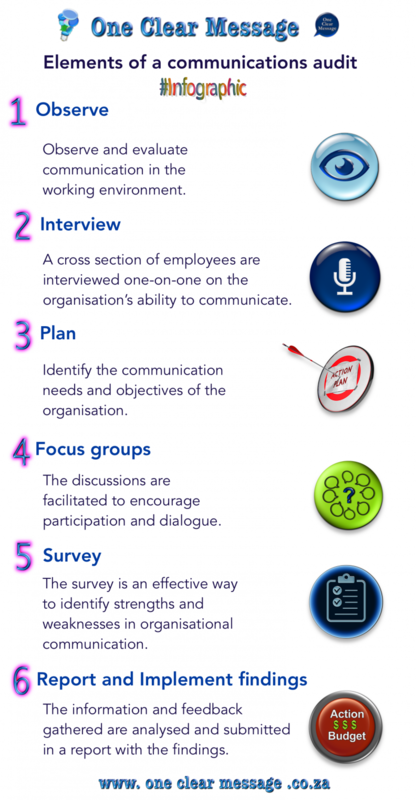 The survey is an effective way to identify strengths and weaknesses in organisational communication. A similar survey or face to face interviews are used to gain feedback from external stakeholders such as suppliers, customers and other businesses the organisation works with. Report and Implement findings: The information and feedback gathered are analysed and submitted in a report with the findings. Suggestions are offered on areas of communication that need improvement, and a plan of action with details on the steps of how to accomplish those improvements are included in the report. Is organisational silence killing your company?